Relevant outreach, trainings, and effective field experiences are essential to enhance the skills and knowledge of natural resource professionals, and to create an engaged and active base of stakeholders and volunteers. I provide full-day and half-day workshops including classroom sessions, labs, and/or field experiences for both youth and adult groups. Additional programs include speaker series, bioblitzes, and developing and implementing stewardship learning and citizen science projects.​ I believe in empowering people, especially youth and traditionally unders​erved populations, to investigate, understand, appreciate, and protect the natural world. Workshops available on: aquatic invertebrats; beneficial insects; insect pollinators; dragonflies & damselflies; freshwater mussels; insect migration. ​Trainings are also available in Spanish. 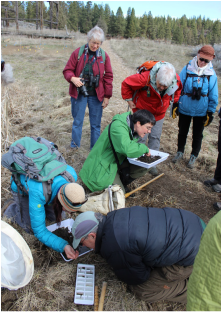 Trained staff and volunteers of watershed councils, non-profits, and natural resource agencies in the US and Mexico in maroinvertebrate survey techniques and identification to enable them to conduct long-term independent monitoring; conducted national-level webinars for Natural Resource Conservation Service biologists. Designed, delivered, and managed international citizen science projects to study dragonfly migration in North America; designed citizen science program for monitoring western freshwater mussels and translocating populations prior to habitat de-watering related to restoration work; entomological specialist for community-based bioblitzes done by the National Park Service and regional parks.